New video footage of a virus infecting cells is challenging what researchers have long believed about how viruses spread, suggesting that scientists may be able to create new drugs to tackle some viruses. Previously, viruses were thought to spread by entering a cell, replicating there, and then being released to infect new cells, so that the rate of spread of a virus would be limited by how quickly it could replicate in each cell. However, a virus called vaccinia spreads in a different and much faster way, according to a new study in the journal Science by researchers from Imperial College London, funded by the Medical Research Council. Vaccinia is a poxvirus and is the vaccine that was used to eradicate smallpox. Using live video microscopy, the scientists discovered that it was spreading four times more quickly than thought possible, based on the rate at which it replicates. Videos of virus-infected cells revealed that the virus spreads by surfing from cell to cell, using a mechanism that allows it to bounce past cells that are already infected and reach uninfected cells as quickly as possible. Early after vaccinia infects a cell, it expresses two viral proteins on the cell surface, which marks the cell as infected. 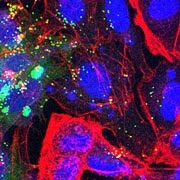 When further virus particles reach the infected cell, these proteins cause the host cell to push out snake-like projections called "actin tails," which drive the virus particles away towards other cells that they can infect. The particles thus bounce from one cell surface to another until they land on an uninfected cell. In the study, the researchers prevented the virus from making the proteins needed to make the actin tails in the early stages of infecting a cell and showed that this slowed the spread of the virus dramatically. The researchers believe that other viruses also employ rapid spreading mechanisms. For instance, herpes simplex virus (HSV-1), which causes cold sores, spreads at a faster rate than should be possible given its replication rate. Thus, this phenomenon discovered with vaccinia may be a common feature a viruses. The discovery may ultimately enable scientists to create new antiviral drugs that target this spreading mechanism. “For more than 50 years viruses were thought to spread by an iterative process of infection, replication, release and re-infection, so the rate of spread was limited by the speed of replication. However, my colleagues Virginie Doceul, Mike Hollinshead and Lonnerke van der Linden discovered a novel spreading mechanism that is not limited by virus replication rate and accelerates spread dramatically. “This fundamentally changes how we think about virus dissemination and similar strategies may very well be exploited by many viruses,” added Professor Smith.